The memorable crossroads in the life of Elizabeth Anne Brett were remembered at her Thanksgiving Service at St Andrew’s Church, Aysgarth, on Tuesday, 5th February 2013. Elizabeth was just two years old in 1924, the youngest of five girls, when her father died and her mother sold their fruit farm in Paarl, South Africa, and took up a position as matron at the Diocesan College (Bishops), a boys’ public school in Cape Town. She lived with her mother at the school and this was where she met and fell in love with the head boy who was sadly killed on active service with British Forces during the war. Some years later, a young army Captain, Harold Brett, whose brother taught at Bishops, passed through Cape Town en route to Burma. Elizabeth corresponded with Harold for three years and in 1945 she bravely and clandestinely boarded a troop ship en route to England. She was only given 12 hours’ notice of the ship’s secret departure and could not tell anyone because the Japanese were still bombing Allied shipping. They were married that same year at Church Stretton in Shropshire. Harold remained in the regular army until 1951 when he and Elizabeth bought a farm on the Isle of Wight. There they spent six years working hard together, and raising three children. In the following years they made three more moves before settling in Harrogate. In 1978 they moved again – this time to Yoredale House in Aysgarth. Harold stocked what was then the village shop with everything everyone could possibly need while Elizabeth ran a successful bed and breakfast business and catered admirably for weary travellers, lone walkers and the happy families who visited year after year. In 1982 they retired to Green Bank in West Burton but Harold died six months later. When the upkeep of Green Bank became too much, Elizabeth acquired the neighbouring field and had her final home built – Field House. It was there that she died on 27th January aged 90. 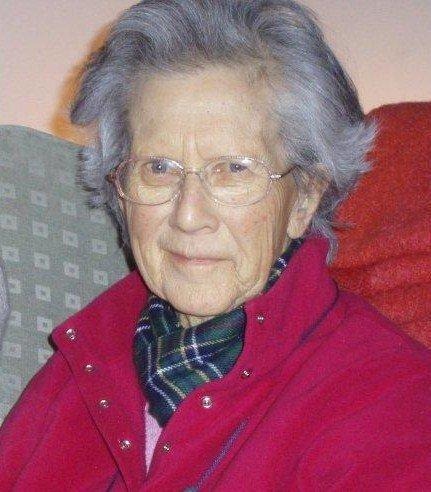 The Rev Canon Sue Whitehouse remembered her wonderful smile and her mischievous sense of humour and recounted that she rarely thought of herself but was always caring for the happiness and well-being of everyone around her. Elizabeth was a kind and gentle lady, warm and welcoming to all, with a smile that warmed many hearts. She was good at all those ‘mother’ crafts – cooking, baking wonderful cakes and fudge, sewing and knitting. She designed her own tapestries and became an accomplished painter of watercolours. She loved all animals and was never without her beloved spaniels. A keen gardener, she grew all manner of plants, in particular the lavender and everlastings which were used to make many flower arrangements. Close family at the Thanksgiving Service were her son Michael, her two daughters Sue and Barbara, and her grandchildren Dan and Lizzie.